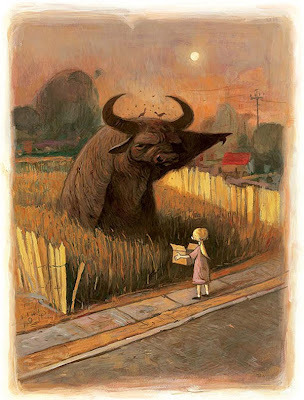 When I was a kid, there was a big water buffalo living in the vacant lot at the end of our street, the one with the grass no one ever mowed. He slept most of the time, and ignored everybody who walked past, unless we happened to stop and ask him for advice. Then he would come up to us slowly, raise his left hoof and literally point us in the right direction. But he never said what he was pointing at, or how far we had to go, or what we were supposed to do once we got there. In fact, he never said anything because water buffalos are like that; they hate talking. This was too frustrating for most of us. By the time anyone thought to 'consult the buffalo', our problem was usually urgent and required a straightforward and immediate solution. Eventually we stopped visiting him altogether, and I think he went away some time after that; all we could see was long grass.